In this article we Review the Briggs & Stratton 30679 Portable Generator (8000W Elite Series). This is an impressive heavy-duty generator with plenty of power to get you through any emergency, disaster or if to keep you productive on your jobsite. You won’t be taking this camping but if you need a high quality portable generator then this is an excellent choice. And also, we review the Generac XC8000E (6826) to give you an alternative generator to consider. Some may feel that calling an 8000W generator “portable” is a bit of a stretch. Any generator producing this kind of power is going to be heavy, use more gas than a small machine, and they’ll never be as quiet. This is inevitable and something we have to deal with when buying a generator of this nature. When you consider that the 8000W spec is for running watts and the Briggs & Stratton 8000W Elite actually has a starting capacity of 10,000W, you’d expect it to be much heavier, noisier and more bulky. So in that sense, the Briggs & Stratton is more portable than many of its counterparts. It certainly has big enough wheels and a great fold down handle to make it as portable as a generator of this size can be. This review is going to take a detailed look at the Briggs & Stratton 8000W Elite generator series which includes a standard 8000W generator with 10,000 starting watts and a model with their all new InfoHub Wireless technology. More about that later. I’ll also be comparing it to a worthy rival, the Generac XC8000E (6826). 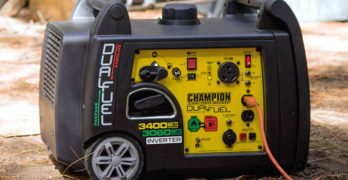 Both are among the most affordable generators in their class. That is if you exclude ridiculously cheap generators that really aren’t worth considering. When we want value for money, getting a reasonable price is one thing, but wasting money on a pile of junk is simply an outright waste of your hard-earned cash. So, in the realm of cheap and reliable generators, Briggs & Stratton are among the best. In the past, I was never a big fan of Briggs & Stratton generators. They all had their idiosyncrasies. Heading out to start your old Briggs & Stratton was always met with a degree of trepidation, especially in cold weather. Armed with a can of Quick-Start to spray into the carburetor, you’d head out and hope for the best. I’m happy to say that things have changed a lot in recent times over at Briggs & Stratton. I’ve checked out most of their newer generators and, despite my earlier prejudice toward the brand, I’ve been pleasantly surprised. The 8000W Elite series has certainly done a lot impress an old skeptic like me. Like all their new engines, this model starts incredibly easily, never mind the weather. A state of the art alternator, produces a very stable voltage without any surges. Briggs & Stratton have also come up with ingenious electronic advancements, among these Bluetooth connectivity. Though, I have to admit, there’s a little more plastic on this model than I’d like. But you must take this statement with a pinch of salt. I’m more of a Honda or CAT kind of guy when it comes to generators. You could probably buy four Briggs & Stratton 8000W Elite generators for the price of one from the other two brands with the same output. Not many people feel this strongly about their power equipment. Why buy a Mercedes-Benz, when a Ford does pretty much the same thing for a lot less money? Well, I drive a Mercedes-Benz, so you get where I’m coming from. I can see, perfectly well, that a Ford is probably going to serve me just as well, I just have a thing for cool engineering and that’s what I like to spend my money on. Since most people around the world prefer the Ford option, I think most generator buyers will be more than pleased with the Briggs & Stratton. This is money well-spent, leaving you with a pile of cash to do a lot of other things with. Money you wouldn’t have had if you’d bought one of the really expensive generators. In the end, with decent maintenance, people who use their Briggs & Stratton generator for the occasional power outage and for vacations in the great outdoors, are going to get many years of faithful and reliable service from this generator. They can handle a good deal of punishment and are certainly not out of place on a construction site where a generator has to work harder than it would in a domestic setting. So I can wholly recommend the Briggs & Stratton 8000W Elite to anyone needing a good quality, affordable generator. When setting out to review the Briggs & Stratton 8000W Elite series, I was quite surprised to see that it only received an average of 3.8 stars from Amazon customers. I would think it deserves a lot better. Though, with all my years of experience reviewing generators, I know that one must not take this entirely at face value. I must have read about 50 different customer reviews from a number of sites to make sure that I wasn’t missing something. I know I said I prefer the more expensive generators, but I think that the Briggs & Stratton 8000W Elite is one of the best in this price range. For that, it deserves a much better rating. What I discovered, particularly with the Amazon customer reviews, is that majority of customer issues have to do with shipping. Now I can’t see this as being a bad reflection on the Brand or the generator itself. This has to do with the retailers, they’re the guys who take responsibility for shipping. When I looked this product up on Amazon, I saw the all too familiar “Available from these Sellers” at the top of the page. This is a clue to the many customer complaints about shipping. I’ve found that buying directly from Amazon is one of the best ways to shop online. They are known to take a lot of care when delivering your purchase to your door. With a large heavy item, like a generator, proper delivery is very important. When it comes to third-party sellers, you can’t always be too sure how much care they put into delivering your product in perfect condition. So, even when buying a generator on the Amazon site, the delivery can be the responsibility of the seller, and Amazon. This is something to consider. The only other customer complaint that I found to be worth mentioning is one guy who received a generator that would not start at all. He took it to a Briggs & Stratton service center and they said the engine had to be replaced. This was done under warranty. So, while being an inconvenience, it’s not like he actually lost anything. In fact, I’m more than impressed that Briggs & Stratton were prepared to replace an entire engine under warranty. So many manufacturers would find a million reasons why they won’t replace the engine and put the blame on you. If anything, this shows that Briggs & Stratton are trustworthy and having a warranty that you can depend on, is certainly something I appreciate. The Powerful 8000W Elite generator series from Briggs & Stratton is their biggest and, probably the best that they have to offer. As I mentioned in the introduction, you have two options. Their standard 8000W generator produces 8000W of running power with a great start up capacity of 10,000W. This is enough power to keep most of your household electrical equipment powered up during on an outage. 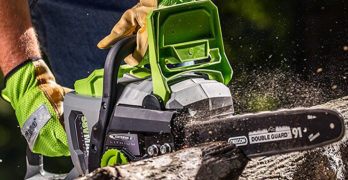 On a jobsite, you’re able to use several, high-powered tools running simultaneously without the generator tripping when more than one tools starts at the same time. For less than $100 extra, you can include the revolutionary InfoHub Wireless Technology. Free, easy-to-use InfoHub Portable Power app :Download the intuitive app from the Apple® App Store or Google Play store in just minutes. The app is best equipped for an iPhone® 6 running iOS 9 (or newer) or a Samsung Galaxy S6 running Android 6.0.1 (or newer). Bluetooth technology that allows us monitor our equipment remotely from a smartphone, computer or tablet is changing the way we do things. By installing the Briggs & Stratton InfoHub App, which is available for IOS 9, Samsung Galaxy 6, Android 6.0.1 (and all subsequent versions), you’re able to receive information directly from generator – no matter where you are. You can check the status of your generator at any time. You can also receive alerts sent directly to the device of your choice, so there’s no need to go out and check up on your generator. It will not only alert you as to when the generator needs a service, but also inform your dealership, so they can schedule a service for you. It’s the latest thing in user convenience. The App is customizable with any number of user options. The Briggs & Stratton 420cc engine is a powerhouse of note. 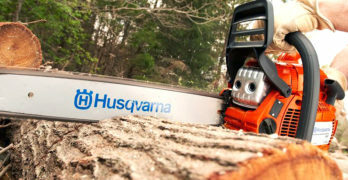 It has a key to start it using an electric starter and, when needed, you can make use of a recoil starter. The starting procedure is made really easy and fool-proof. An On/Off switch and choke knob are placed onto the user dashboard with direct access – no more fumbling around the carburetor to find a fuel shutoff or choke lever. The Briggs & Stratton has a massive 7.5-gallon gas tank which is great for large engine. At 50% of its rated load, the Briggs & Stratton 8000W Elite will provide continuous power for about 9-hours. On average, you’ll be using a 4000W of power for at any given time in average suburban home. So, under normal conditions, you should expect to get at least 9-hours of runtime before refueling. This fuel consumption rate works out to be 4.8 kilowatt-hours per gallon of gas, which is very reasonable for a generator of this size. A Low-Tone muffler helps a lot to reduce the noise levels. Though you cannot expect this to be a particularly quiet generator. A 420cc engine in an open frame, without any sound insulation panels, is going to make some noise. The muffler also has a spark arrestor. The alternator is also a well-made robust unit and has what Briggs & Stratton call Power Surge. This basically means that it will step up the normal 8000W output to 10,000 watts for short period when heavy equipment, like a refrigerator and larger power tools, need an extra boost of power to start. This is common to just about all modern generators, so it’s not unique to the Briggs & Stratton 8000W Elite series. Though a power surge capacity that’s 25% of its normal running load is better than average. This makes the Briggs & Stratton 8000W one of the best for electric motors that use a capacitor. If you have a refrigerator (or two), freezer and sump pump running on generator power, it’s highly unlikely that you’ll ever run out of usable watts. The generator won’t trip the main circuit breaker too easily. Although this is not an inverter generator, it has reasonably stable voltage with an Automatic Voltage Regulator (AVR). So it may not be ideal for sensitive electronics, it’s less likely to cause damage to your TV or computers. To play it safe, you may want to plug your electronic equipment into a small UPS that will protect them. This recommended procedure, even when using mains power which can fluctuate occasionally. So best practice is to plug your computer, TV and similar equipment into a UPS permanently. This ensures that they always receive clean low HD power and won’t shut down unexpectedly when the power fails. The battery in the UPS will give you enough time to start your generator without an interruption in the power supplied to these devices. I’ve already discussed the InfoHub system, which is a unique and very useful feature that will attract many to the Briggs & Stratton 8000W Elite series. Though, in general, it has all the great user functions that can compare to any of the best generators. The neat control panel includes 4 X 120V 20A household outlets and a 120V/240V, 30A, twist lock outlet. All the outlets have overload circuit breakers and GFCI protection. All the outlets have good plastic covers, protecting them from damage. One thing that always bothers me about using a 30A outlet on generator of this size, is that you cannot make full use of the power available to you using this outlet. At 120V, the peak power output of 10,000W is 83.3A. Even at 240V this works out to be 41.7A. In both cases, this is well below the maximum rating of 30A. This means making use of all the outlets to utilize the full power of the machine. This is fine for a construction site, you can plug extension cords into the four 20A outlets and the 30A outlet. Though when connecting the generator to a transfer switch in order to use it to run through your house wiring, this isn’t going to be an easy task. This isn’t just a problem on the 8000W Briggs & Stratton, it’s common to many generators. Although many large generators have a 50A and 30A 120V/240V twist lock receptacle which is much better. It has an electronic display on the control panel that allows you to check voltage and runtimes at the machine. It also has a fuel gauge on the steel gas tank that’s quick and easy to read. The oil filler and dipstick are easy to access and the engine has automatic shutdown for low oil level. If you’re using the InfoHub, you’ll get an instant notification when this happens. Transporting a big generator that weighs 224 LBS is never easy. Even moving around your garage can be a problem. For this class of high-powered generator, the Briggs & Stratton 8000W Elite is better than most. First of all, at 224 LBS, it isn’t as heavy many others. Then there’s the great handle with plenty of leverage to give you a good weight balance. Thick padding on the handles are a bonus. The Briggs & Stratton has huge chunky never-flat wheels with good tread. This makes it easy to move, even when the surface isn’t entirely flat. What doesn’t impress me too much are the plastic wheel rims. This is still a heavy machine and I feel, with this type of weight, steel rims would prove to be much more durable. They might be fine if you’re only going to be wheeling it around on a paved surface, and take some care when turning, as not to place too much stress on the wheels. But if you’re going to be transporting and moving the generator on daily basis over rough terrain, these wheels may prove to be a drawback. On the whole, this is a tough machine. The metal frame has a good coating and so does the metal fuel tank. I’ve mentioned my concerns about the wheels and this would be my main complaint in terms of durability. The user panel is also plastic. Though this seems to be quite tough and is slightly recessed into a metal frame which should provide some protection against those inevitable knocks and bumps during transportation or on a busy jobsite. The engine and alternator certainly appear to be well-made and should last a long time with the recommended service intervals. In this price range, the Briggs & Stratton 8000W Elite series is one of the most durable. As far as power, build quality and user features go, you’re unlikely to find a better generator at this price. It offers everything that the home user or contractor would want. This makes it an ideal generator to use for home backup power, a jobsite and it will provide enough power for the largest of RVs. Like a trusty Ford, Briggs & Stratton generators have that same all-American common sense attraction. For more than a century the name has been a symbol for affordable quality. With an expansive dealership network and a 2-year (residential) warranty, you can certainly go out buy this generator with complete confidence. Engineered with the GENERAC G-FORCE ENGINE — Designed to run cooler with increased surface area for maximum heat rejection. With 10,000 starting watts and 8,000 running watts. Engineered specifically for contractors and construction sites. X-Frame – Fully Wrapped, Heavy Duty 12 Gauge Steel Tube Provides rugged durability and protects the generator and fuel tank from damage. While the Briggs & Stratton 8000W Elite Series is a durable generator, it’s not what I’d call heavy-duty. These generators are great for the home user and medium-duty construction site applications. For a truly industrial grade generator, one would naturally expect to pay a lot more. When we look at the commercial or industrial machines, the price can become a serious deterrent – costing around $4000 up to about $10,000. There are those who pay this kind of money for tough generators that are used in hardworking environments. Though, there are cheaper options. While the Generac XC8000E may not be up there with the big guys, it’s a mighty tough generator and costs about half of what you’d be paying for a Honda 7000W generator, which doesn’t have the same high-watt output. Sure, the Generac is much more expensive than the Briggs & Stratton 8000W Elite series. But, then again, it is built to an entirely different standard. Just one look at the incredibly tough 12-gauge steel frame, and you can see that this powerful 8000W generator with a 10,000W peak output is designed and built to take a lot of punishment. The Generac XC8000E is to industrial heavy-duty generators, what the Briggs & Stratton 8000W Elite is to medium-duty home generators. An excellent machine at a very reasonable price. This is a big, heavy brute, weighing 260 LBS. Almost 40-pounds heavier than the Briggs & Stratton 8000W Elite, this is clear evidence that there’s a lot more high-grade steel packed into this industrial machine. It has heavy-duty, steel rim wheels to contend with this weight and dual fold-down handles that make it easy enough to lug this beast over some pretty rough terrain. The axel is integrated with the heavy-duty frame and won’t easily be damaged during transportation. This generator can take more punishment than most. There’s a metal tubing roll cage to protect the fuel tank and a lifting eye with a perfect center of gravity for lifting the machine onto a truck. The Generac G-Force 426cc engine with full pressure lubrication is an impressive, very powerful, unit. The XC8000E 6826 model is EPA and CSA certified (49 states and Canada). For California residents, there’s the 6827 model which is the same generator with CARB certification. This is great engine and easy to start with an electric starter. Unlike, the Briggs & Stratton that has all your starting functions on the user panel, Generac have taken a more old-fashioned approach. There’s a run-stop switch on the user panel which is very convenient, but the fuel shutoff is at the tank and it has a conventional choke lever at the carburetor. This isn’t really a big deal, anyone who’s been using a generator for years is probably very familiar with this type of setup. The alternator is certainly one of the best. As far as I know, only the top CAT and DeWalt models match the incredibly low (<5%) THD current that this generator provides. While this is not quite as clean as the power that you get from an inverter generator which are normally less than 3% THD, it is still within acceptable levels for electronic equipment. Your mains power from the grid is likely to be in the same less than 5% range. In some areas, mains power can even exceed this THD level during peak load times. Basically, you can safely plug a computer or any other electronic device into the Generac XC8000E without any fear that it may incur some damage. When looking at run-time and fuel consumption figures, the Generac is certainly one of the best. It has a huge 11-gallon gas tank and this will keep the generator running for about 11-hours at 50% load. The power output of this generator is the same as the Briggs & Stratton 8000W Elite (4000 running watts and 10,000 peak watts). The gas tank holds a gallon more than the Briggs & Stratton, giving it an extra 2-hours of runtime. So which of the two is more fuel efficient? Calculating the runtime to gas tank size ratio, the Generac has a gas consumption figure of 5.2 kilowatt-hours per gallon, a good deal better than the 4.8 KWH/G of the Briggs & Stratton. For every gallon of gas that you burn, you’re getting 0.4 extra kilowatts (400W) from the Generac – a fuel saving that’s a little under 10%. The Generac XC8000E has all the outlets that one could possibly need, except a 50A 120V/240V outlet. Though it seems clear to me that they’ve thought of the contractor when selecting which power outlets to provide. It has the usual 4 X 120V 20A standard outlets that one would commonly find on a generator of this size. It also has a 120V, 30A, twist lock outlet which is ideal for high-powered 120V tools and machinery. It also has a 30A, 120V/240V twist lock outlet. This allows you to run a compressor and a table saw simultaneously — regardless of their voltage. All the circuits are protected by overload breakers and there’s a main GFCI breaker for all the outlets. The outlets are protected by heavy-duty plastic covers and the engine has low oil shutoff. You get an hour meter on the control panel but no other indicators. Not something that would bother me, keeping track of service intervals is the most important consideration, so it’s great that they’ve fitted an hour meter. The Briggs & Stratton 8000W Elite series is designed more for home the user so, while not as robust as the Generac XC8000E, it has a lot of user friendly features – like a simple start up procedure and the InfoHub system. In stark contrast to this, the Generac has fairly basic features, but has the robust design and high-amperage outlets that are more attractive to contractors. The 2-year commercial warranty and 3-year residential warranty is yet another sign that this generator is intended for a hardworking industrial environment. So there you have it. Two very different generators with one thing in common. Both of these machines are probably the best value for money generators in their respective classes. The Briggs & Stratton 8000W Elite being a great and inexpensive generator for medium-duty conditions and the Generac XC8000E is certainly one of the lowest priced heavy-duty generators. Visit the Generac site to learn more.